In the scientific work authors  perform an anastomosis of the native esophagus after patient-adapted elongation therapy avoiding gastric pull-up and colonic interposition. Five children with CLGEA (≥5 vertebral bodies gap) were referred to our department in 2016. All patients had been operated on previously at outside facilities. All children were admitted to our department with esophagostomy and gastrostomy after having anastomotic insufficiency and/or esophageal (in two cases) or colonic interponate necrosis (in one case). As one of our major goals is to perform an anastomosis of the native esophagus, we used a Foker-technique using traction sutures to lengthen the esophageal pouches within days and multistaged extrathoracic esophageal elongation described by Kimura, to solve the long gap problem and make a primary repair possible. anastomotic leak, stricture and respiratory problems. In the scientific work  showed cases with insuperable diastasis between segments of the esophagus are the most complex. Induction of esophageal growth by its extension proposed by Focker is one of the most popular methods of solving this problem. The clinical case of treatment of the child with multiple malformations, including an esophagus atresia with insuperable to diastases is given in article. 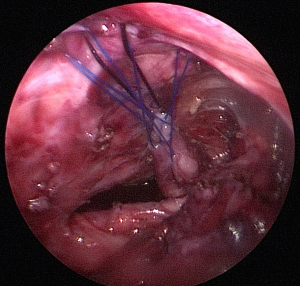 Multistage esophageal elongation using combined Kimura and Foker techniques is a challenging undertaking that requires a series of surgical interventions. However, anastomosis of the native esophagus can be achieved. Pros and cons must therefore be carefully weighed.